- Forbid elbow gaps between the bottom of the biceps and the top of the forearm. - Forbid some more the elbow gaps. - Forbid any kind of elbow gaps once and for all. From what I remember EIB is all about the overall appearance of the armor seen from a distance (as opposed to Centurion more focused on details). Elbow gaps are just that. Something that is visually striking and that has a huge impact on the look of an armor. 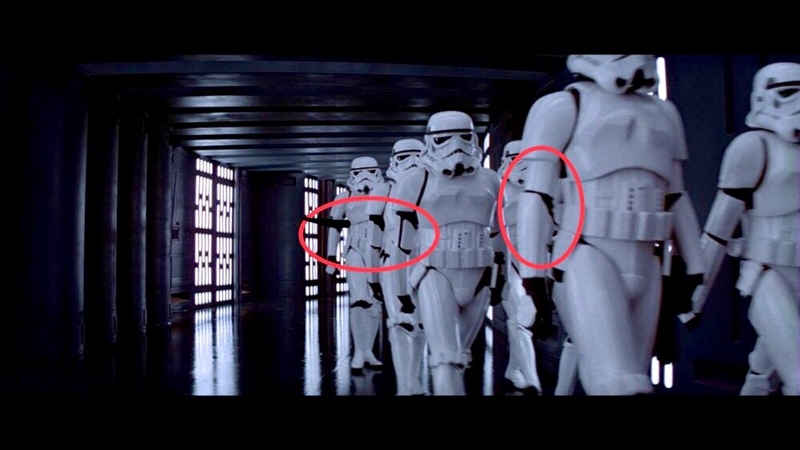 I challenge anyone to find just one stormtrooper, whether it's from A new Hope, The Empire Strikes Back or The Return of the Jedi with a gap between his biceps and forearm. Spoiler alert, you won't... Hence I can't understand why they have been tolerated for so much time now. On top of that, it's change that doesn't cost anything to the builder, it's only a matter of correct strapping. So please. For real... I think its about time we adress this matter and get rid of it... It's been way too long. '- There must be no gap between the bottom of the biceps armour and the top of the forearm armour, except for the cut allowing to bend the elbow. If you have trouble bending the elbow, it means your biceps armour needs to be lowered down from inside the shoulder bell. Here’s some interesting troopers from ANH. Gaps and open biceps, and the one on the far right that’s not circled is obvious as well. A bit hardline to ‘Forbid’ accurate armour. As stated by others here, we are not all built the same. Our armour is a reflexion of us as individuals as much as it is a reflection of our screen heroes…troopers are heroes too…and that hardline position would mostly serve to ostracize those who don’t naturally conform to the parameters set by Mr. Lucas during filming. He had the luxury of screening to fit his needs. We, as individuals, don’t. We are a community of equals in odd sizes and shapes. I’ve read the posts through this thread and, much to my dismay, have to agree with the intent and reasons for the changes. Since my lid has a low brow and is not yet approved I will need to alter it to meet the L3 requirement. Fortunately it’s just the brow for me, a slight trimming should fix it. For those who have, or are just about to, submit for centurion it may be a crushing blow after countless hours of dedication to a build based on the old standards and acceptabilities. It may be prudent to inform everyone who receives the newsletters that submissions after the next newsletter will be subject to the updated CRL amendments. I only found this because I was looking for information on correct return edges. Some good points have been made in the last couple of posts. We are not the RPF, we should not be making too many constant changes that start to discourage members from aiming higher. Prop replication is not what the Legion or FISD strives for, although we are reasonably close to the mark. Continuity is the best tool we have for the little things that are easy enough to be done. Size is a great example and cant be discriminated against, so please always bare in mind any changes you make should always be in the spirit of EIB and Centurion. (the different brow heights is good, the ear angles can be far more difficult to fix if not impossible in some cases so be wise with your suggestions. We cant judge a member on the armour they purchased we can only guide and help them build it the best they can, please dont forget this. Paul's suggestion of looking at CRL adjustments quarterly is far more feasible for better stability and uniformity plus easier on GML's etc, remember what I said about the RPF. AND... hopefully we hit the March to 1000 EIB early enough in the year to celebrate with some special merch. I adjusted my brow, not as easy as I’d hoped. I raised it to 5mm. I personally don’t like it as much but it still looks very cool. This is an AM ARMOR bucket. I was careful to rake the ears correctly when I started. I do need a new brow trim now though…little slip with the knife. Saved my finger though, the force was with me. For anyone looking at centurion build currently, follow the current CRL. Do not go by the suggestions stated as at the moment they are only suggestions. If you have any questions about a look or appearance of your build for approval reach out to one of the DOs. They'll make sure to point you in the right direction as they'll be approving your EIB and centurion. Not sure it's appropriate for me to comment on this since my TK has not yet been approved (I'm reeeeeeally close, though). However, one thing that's bothered me just a bit is the photo that is always used to illustrate the ear-screw angle aligning with the back of the trap -- the green line that is aligned with the trap doesn't go through the centers of both screws. I pulled the image up in Photoshop and added a new line as closely as I could directly through the centers of the screw heads, and it gives a somewhat different angle. It's a really lo-res image so seeing the screws clearly is tough, but I think the red line is closer to the actual angle of the screws. You are always more than welcome (and encouraged) to participate in discussions here at the FISD, A.J.! The reasoning behind the angled ears suggestion is that we see more than a few submissions for higher approvals where the ears are almost vertical instead of being slightly angled, or the top (round) part of the ear is not centered with the back of the trap. Below is a photo of a Hero bucket that better illustrates what I mean. The screws are not perfectly aligned (but are close) and have the "ideal" angle. We realize that there were inconsistencies in many of the troopers in the OT, but for the most part the majority were very similar. If those aiming for Centurion are aware of the "standards" before or during their build, it will save them having to re-adjust many parts afterward if they are aiming for higher levels. I honestly think more thought goes into this here, then the original prop makers put into theirs. Sorry for the late. Here's my 2 cents. We have never used exact measurements for anything so I would encourage throwing out the idea. Ear angle. Since I'm the responsible party for bringing this to the forefront of level requirement I am all for it however, as mentioned already I'm not sure it's possible with all armors hence the reason I never insisted we add it to the CRL. I stick by my thought as "highly suggested" at L3. We already have a minimal gap policy at the shoulders for L3 so maybe changing it to "minimal gap between shoulder bells and shoulder, back & chest plates". Dude, did you just photoshop this screencap?! Here's the unaltered still from ANH. No gaps at all, except for the v-shaped cuts to the top of the forearm's inner half so that the arm can be bent. 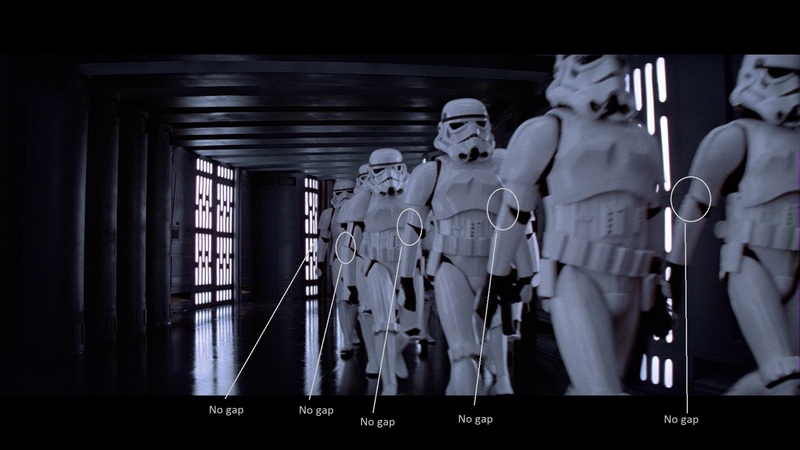 And once again that argument of the different morphologies allowing you to have a gap or not is entirely false. As long as you position the articulation between the biceps and forearm at the same level where your elbow is, no matter how long or short your arm is, you will be able to bend it. The only thing that will change is how much your biceps is inside the shoulder bell. And for people with very long arm, how much of a gap between the bottom of the forearm and the handplate there is. Ukswrath makes excellent points, and I think it all comes down to simple copyediting of the CRLs. What Tony is suggesting is that the wording of the CRLs could be tweaked to strongly encourage the changes put forth in this thread -- especially when using the CRLs as a building guide as so many of us aspiring to higher levels do -- while at the same time not shutting out folks for whom these changes would be difficult or impossible depending on their armor maker, their body size, and body mechanics. 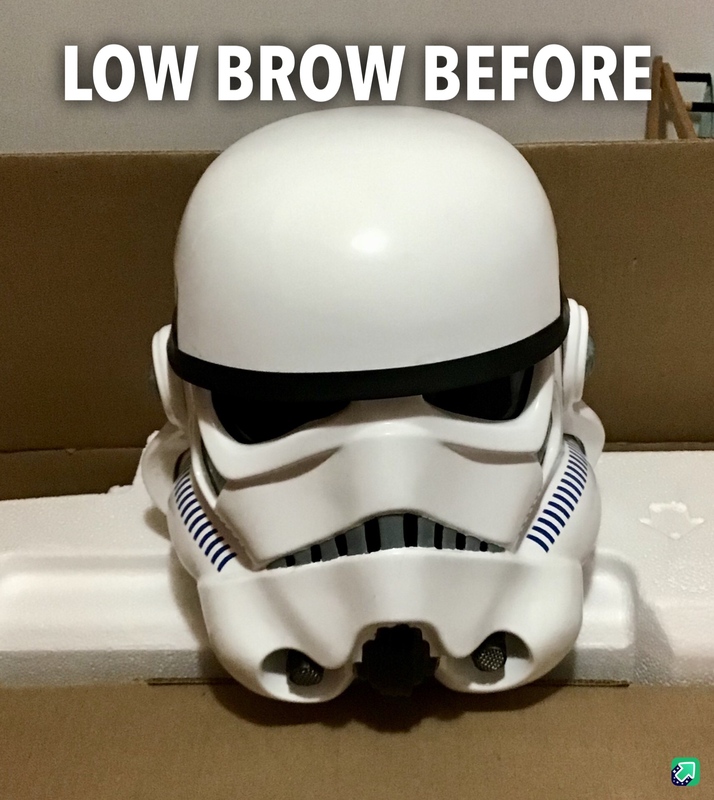 Meanwhile, despite my initial concern that having followed existing CRLs when building my bucket I'd now have to take it apart and redo the brow and ears, in looking at my helmet I think I'm already pretty close to the suggestions put forth in this thread, which is a relief. Helmet looks great the way it is! Now for those of you that are not GML's or have not been a GML, please bear in mind that a vast amount of legion members are not concerned with higher levels of accuracy. There are certainly many members in all detachments that are very in tune with their costume of choice and strive for screen accuracy. But many members just want to have an approved costume and troop for charity. As a GML and a Command Staff member of the FISD it can sometimes be difficult to tone down my passion for TKs when I am going over an application. Not everyone is going to have the perfect TK costume out there and we need to sometimes remember to keep things "basic." Whilst this accuracy is all well and good when it comes down to it, this is not a replica group. I don't feel we should be enforcing the exact angle of the ear or brow height at anything less than Centurion. Troopers should, for the most part, look the same. If we're down to such minutiae as the brow gap being 5mm off or the ears being off by ~10° then I'd suggest we're already doing a pretty decent job. Provide the information, those who wish to built to it will always exist but I don't feel this level of detail should be overly enforced. No wonder we are on the same team. He tend to see things in the same light. He’s my FISD BFF so take a step back, I’m territorial with my friends. I already have to share him with Greg, he doesn’t need more friends! With respect, I don’t feel that brow placement is getting into in-depth replica territory. This isn’t SWAT, emulating a specific trooper. To my eye, it’s a simple case of spot the difference. I understand the appeal of the low brow look. That said, I personally feel that it is more representative of certain hero helmets in ANH, as per the CRL and reference material. Much like the 6 teeth drilled and narrower frown. I have to say that I think the proposed changes are going a little too far in my opinion. I built my Anovos kit to Centurion spec using all the correct materials, snaps, screws, paints and closing every gap the best I could using the awesome guide from Tony. 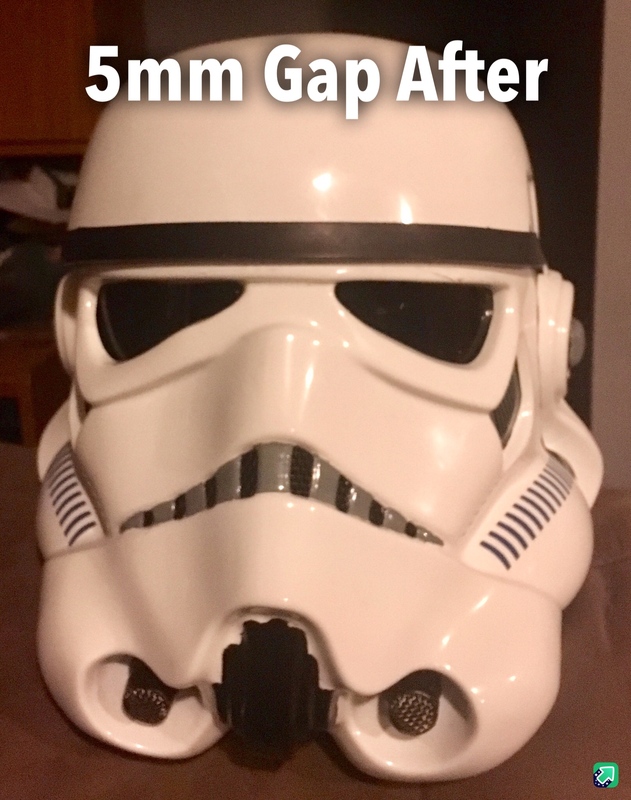 I just got my silicone handguards from Justjoseph and after reading this feel like all the work was for not and a little frustrated. I will say that I am a perfectionist and love the little details and can't help but pick other's armor apart in my head on troops or just make a simple suggestion that might help them look better but we are arguing about the minutiae here with millimeters and degrees. As said before this is not an exact replica group of the screen used armor but the Centurion should be as close to ideal as reasonable using all the correct snaps, paint colors but should still be attainable to all troopers. The reality is that the screen used armor was abused, damaged and not everyone was exactly the same even though some like to believe it was. On the flip side, what happens if for some odd reason I built my armor to the exact spec, gaps and clearances of a screen used armor but it didn't have the exact brow gap or elbow gap as the proposed Centurion changes? How would that not qualify for Centurion, baring obvious things like gaffers tape and open shins? I am still going for Centurion but I am 6'3" tall and 198 lbs so no, I can't possibly get every gap perfect and am not going to buy and mix an match every brand of armor to get every little gap perfect due to cost and none of the colors will match and look even worse. Trust me I have tried, if I close the gap completely on the elbow as suggested then my wrists look like they are about 4" out of the forearms and that looks way worse than a gap at the elbow. The same goes for the shins, if I don't have a larger gap at the knee then my boots are out of the bottoms and again just looks worse. I know the goal is perfection but don't use the idea the John Q public is going to know the difference at all. They don't even see the difference between Stunt, Hero, ROTJ or ESB. I guess my actual point in my rambling is that let's not take this too far that Centurion isn't reasonably attainable. I know the goal is perfection but don't use the idea the John Q public is going to know the difference at all. They don't even see the difference between Stunt, Hero, ROTJ or ESB. I guess my actual point in my rambling is that let's not take this too far that it isn't reasonably attainable. My opinion on the brow and CRL change. I definitely agree with this- I don't see a need to mod the basic approval, as the basic look is much the same, but Centurion for sure, since that's the point, and I could see either way for EIB, no real personal preference there. That's why my first question for every self-proclaimed "biggest Star Wars Fan EVAR" is "Alright, so then which version of the Stormtrooper am I?" Jokingly- I'm not trying to be a jerk, but I like to have fun with the super-nerds. I laugh it off when they get it wrong, and usually there's jokes about having a Silver Nerd Card v. a Platinum one. I've had only one guy get it right thus far. I then promptly told him he needed to join the ranks because clearly he was just as nerdy as we all are. For EIB and Centurion, I don't mind the strict requirements, because they are for us, they are not required in any way, and it's really just a matter of personal choice. Sure, we get bragging rights, but I've never run into anyone who considered themselves above anyone who wasn't EIB/Centurion. I do see your point in that high accuracy is good for the higher ranks, but we also don't want to raise the bar so high that it excludes people for factors they can't control (ie you have to be a certain height, or else nothing will fit right, regardless of what you do). So I agree generally with your point and do thank you for making it, because it is something to consider when updating CRLs. Thanks sharkbait, that's the point I was trying to make. Trust me, I know what you are saying about the general public first hand. My wife is a Shadowtrooper as you can see in my avatar and every troop she is either called a Tie pilot or Darth Vader.